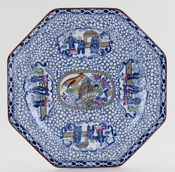 Blue with Colour China - 640 items found. Absolutely gorgeous! 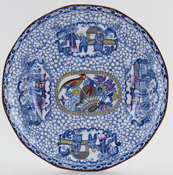 Blue printed under the glaze with hand applied enamel colour and lustre rim. 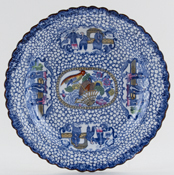 Pattern later called Oriental Pheasants. A little wear to the lustre rim otherwise in superb condition. 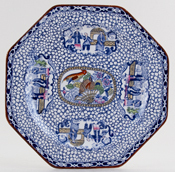 Impressed Ashworth Real Ironstone China and pattern no. in script 111. Lovely jug with ochre rim. Blue printed under the glaze with hand applied coloured enamel. Backstamp: Bisto, England. Some light staining to part of the handle and to a little of the body of the jug - not in a prominent position, to the left of the handle to the base. Ochre rim. 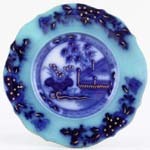 Lovely plate blue printed under the glaze with hand applied enamel colour. Some light crazing to the glaze and small minor firing fault under the rim. Blue printed backstamp Nankin over Caduceus, with Bisto, England beneath. Impressed date mark for 1912? Pattern number C2113 in script. With gilt. 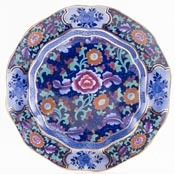 Gorgeous plate with wavy moulded rim decorated in rich bold colours. Backstamp: Booths Silicon China England. Crazed although thanks to the density of the pattern this is really only noticeable from the back. Also on the back just a little minor discolouration. A delightful little cannister. Backstamp: Booths Silicon China Ming Made in England. Light all over crazing and lacking the cover. There is also a small minor blemish on the side, overall absolutely fine. 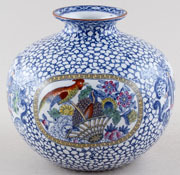 A superb vase, blue printed under the glaze with lavish hand applied colour and gilt. It has light all over crazing othewise in excellent condition. With gilt. A fabulous octagonal vase with gently fluted body and cover. Backstamp: Booths Silicon China Ming Made in England. Fine all over crazing otherwise excellent condition. A stunning piece. With gilt. A stunning bulbous vase with cover With gilt rims and gilt filigree decoration around the shoulder, base and cover. Backstamp:Booths Silicon China Ming Made in England. Light all over crazing and tiny tiny hairline to the rim of the vase otherwise excellent condition. With lavish gilt decoration. This is a stunning bow fronted piece standing on four small feet with two side scroll handles. 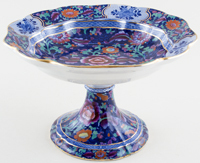 It has a removeable pierced cover for the stems to go in after the style of a rose bowl. 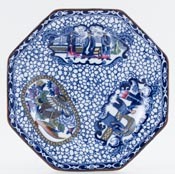 Backstamp: Booths Silicon China Made Ming Made England. It is crazed, although thanks to the pattern this is noticeable mainly from inside. There is a tiny inside rim chip to the bowl which is not visible when the cover is in situ'. Overall excellent condition and an absolute delight. Delightful little jug. 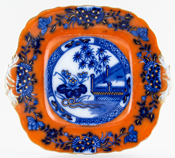 Backstamp: Booths Silicon China Made in England Netherlands These Colours Will Not Perish. There is some discolouration to the foot and underneath, otherwise excellent condition. Fabulous little hot water jug with cover. Backstamp: Booths Silicon China Made in England Netherlands These Colours Will Not Perish. Light crazing otherwise excellent condition. 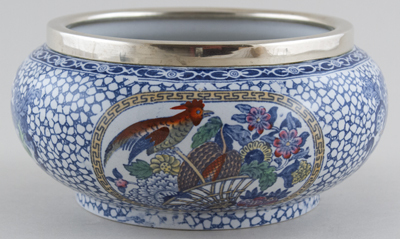 Absolutely delightful little pot with a pierced detail under the spout to prevent dripping. Backstamp: The "Perfecta" Tea or Coffee Pot with "Camel" Patent Drip-Less Spout Patent No 234698 Booths Silicon China Made in England Netherlands. These colours will not perish. Light crazing and to the spout there is a small hairline and a tiny tiny nick to the tip.